Banff National Park is the site where Canadian national parks were born, so I was very excited to visit this place. Having been to the Canadian Rockies before, over 17 years ago, I vaguely remembered the beauty this place holds. I was not disappointed. Never have I seen a place where beauty in nature and stunning landscapes, rivers, forests, glaciers, peaks, emerald lakes and cosy lodges are as condensed as here – within one hour after arriving I swore I’d come back here again and again. First things first – we got our campsite, drove to Banff town, ransacked the tourist information office for brochures and a map and headed for dinner on the roof patio of a nice-looking pub. Over salads and chips, we researched and discussed possible shooting locations and decided to take it easy on our first evening here. So far up north, the sun doesn’t set until 10 pm, and sunrise is as early as 5.30 am, so we wouldn’t be getting much sleep if we shot both in succession. Moraine Lake and the Ten Peaks being kissed by the first morning light. After a short night, we got up at 4 am, drove up past Lake Louise (YES, we would not stop at this iconic location during our entire stay in Banff National Park) towards Moraine Lake, where we’d be shooting sunrise overlooking the lake with the Ten Peaks in the background. What a morning… While we were shooting from a lower section of the Rockpile (offers the best unobstructed views of the scene), we did not notice what was going on further up the hill: about 30-40 other photographers had arrived after us, and we were happy to have arrived early enough to claim a good spot! After telling some people off for launching their drone (strictly illegal within national parks in Canada), we headed back to camp for a nap – but not before screeching to a stop on our drive to photograph a black bear at the side of the road! We spent the rest of the day resupplying groceries, getting some internet at Starbucks to get our blogs up, explore Banff town and visit the Cave & Basin Historic Site, the place where three railroad workers “discovered” the hot spring in a cave and decided to start a business there, which eventually ended up being the Banff National Park. The Emerald Lake Lodge in Yoho National Park, British Columbia, Canada, just after sunset. In the evening, we arrived on our location early again, which was good, as there were plenty of other photographers also arriving at the Emerald Lake Lodge over in Yoho National Park. We ended up shooting until midnight and chatting to a local photographer, Aaron, who gave us plenty of tips on where to shoot around Jasper, which would be our next stop. Having been out so late, we decided to sleep in the following morning, which we both badly needed. A bald eagle flying over Banff, Alberta, Canada. Back in Banff, we rented a canoe to explore Bow River and Vermilion Lake – gorgeous out there. 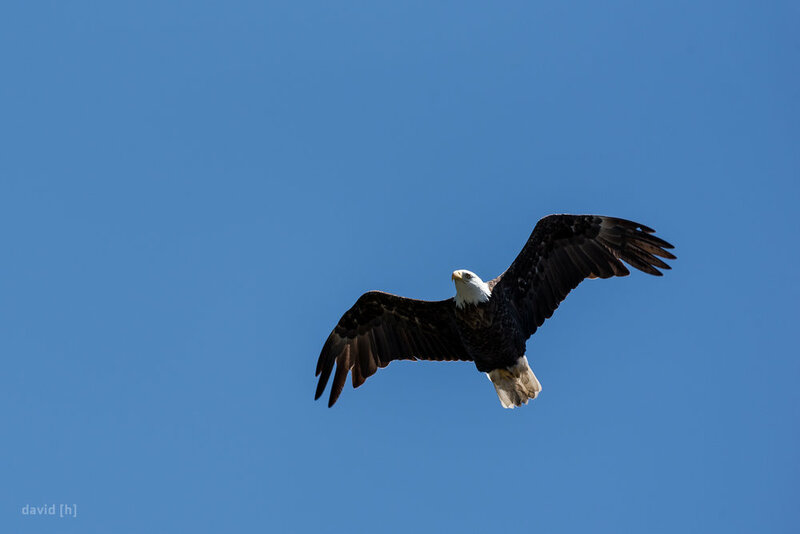 We even spotted a Bald Eagle flying low and got some shots in! Two hours and some intense paddling later, we had our first real camp BBQ, Bison Hot Dogs with mashed potatoes, before heading out to our evening shoot: an iconic stretch of train tracks running through beautiful Banff National Park. After 2 hours though, it seemed like the train services had also been affected by the power outage earlier that day, so no train showed up. Packing up, we decided to come back on our way to Jasper the following day. 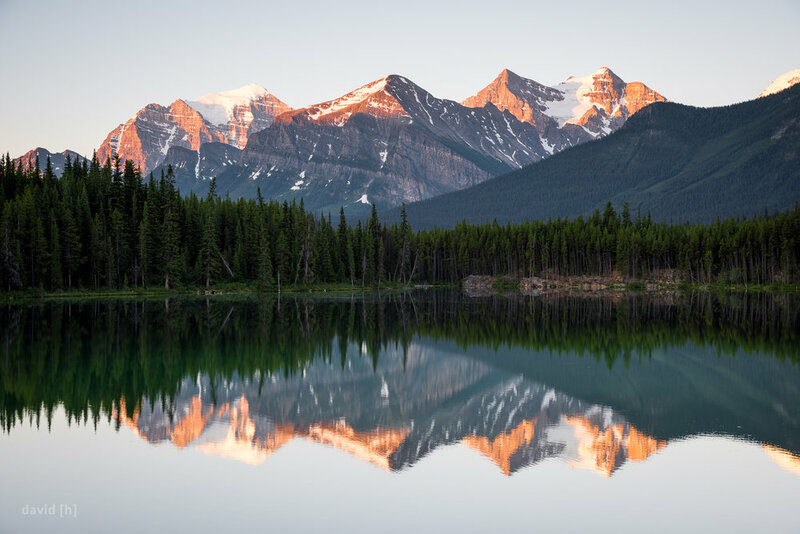 Sunrise reflections in Herbert Lake, allegedly the warmest lake in the entire Canadian Rockies, even sporting a diving board! Sunrise on my last day in Banff was the same as the past couple of days: no clouds, calm, quiet. This time I headed out to Herbert Lake by myself, as Derek decided he was fed up with cloudless skies – can’t blame him. I met Jeff Bartlett, a local photographer, and we ended up chatting for quite some time, brewing some coffee and tea and just having a good time all around. After parting ways, I woke up Derek and we headed off towards Jasper. Banff National Park was undoubtedly the highlight of this trip for me so far. Not even having left yet, I want to come back, for weeks, to explore all the lakes, hikes, rivers, forests and peaks! Another time…!